Alleged to have been with us since the 12C, the Martock bean is a really just a primitive broad bean, a common field bean, used for human and stock food and as a soil improver and green manure. The name comes from the village of Martock and they have an information page about it here which is worth a read. However, my usual cynicism has kicked in and I wonder whether the much transcribed and repeated history of these seeds can possibly relate to the current seed stocks. Nonetheless, I did take a packet from the HSL over 10 years ago now and grew them out on the allotment. Then I packed the beans up in envelopes and forgot about them. This year, I was hoping to grow Egyptian ful. I haven't been able to source any named ful seed and remembering the marked similarity between the Martock and the dried ful available at the grocers' I hoped I would be able to get some fresh seed from the HSL again, but this year they are not offering them. So I went to my seed saving drawer, took out a packet of 10 year old seed and without much hope popped them into a tray of compost. The results are above! You can see a bit of mould where a few didn't make it but for seed that old and not particularly well stored it's a pretty good result. So I'll be growing them this year, damping off permitting, and comparing them to the plants I also intend to grow from dried ful that I bought from the grocer. The seeds themselves are slightly smaller even than the ful, so there isn't any exact match. It should be interesting. I have a concern that the saved seed were grown on the allotment and I made no particular precautions to keep the seed pure at that time but I'll see how it goes and rogue out anything that looks too aberrant. The same goes for the retail food crop ful - I've no idea what the provenance of that is although it's unlikely to be F1 and should be fairly pure as it will have been grown in field conditions. Just as well we love our beans. 10 years - that's good! 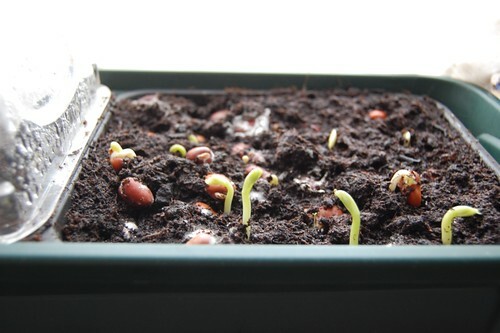 I tried some Martocks after keeping them for seven years and got almost 100% germination. Must be why they've kept going all these year, they're immortal!